WOW: The property includes an ice rink, a home theatre, a 3-story glass rotunda​, many verandas, an art gallery and a sculpture garden. 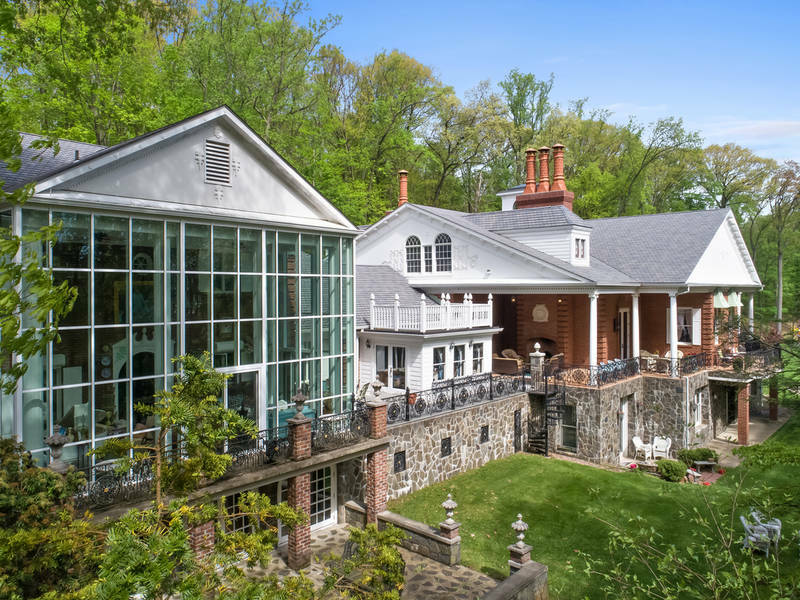 HUDSON VALLEY, NY — New York City-based socialite, philanthropist, artist and Old Fashioned Mom CEO Michelle-Marie Heinemann has listed her 32,000-square-foot country estate at 1111 Route 376 in Wappingers Falls for $30 million. Heinemann is known for her art work, paintings and vivacious lifestyle, and was twice courted to be a member of The Real Housewives of New York cast (turning down the opportunities due to family obligations). She is currently exploring New York City storefront locations for her Old Fashioned Mom-brand coffee, and a Palm Beach location for an Old Fashioned Mom-brand boutique hotel. She was just in England for the Royal Wedding celebrations. 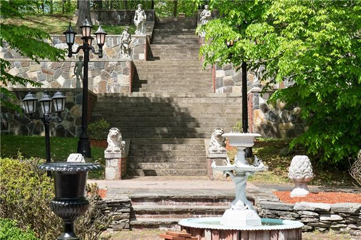 The estate is one of the crown jewels of the Hudson Valley. Its 25.14 acres offer complete solitude while conveniently located on Route 376, which has been called the 5th Avenue of Country Living. 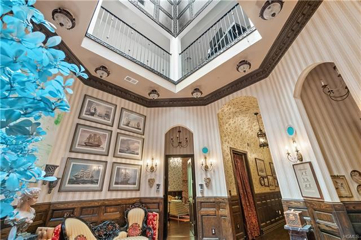 The colonial mansion includes nine bedrooms, eleven bathrooms, five half-baths, a solarium, two libraries, eight wood-burning fireplaces, two kitchens, a wine cellar, an ice rink, a home theatre, a three-story glass rotunda in private wing, multiple verandas, and an art gallery. There is an 8,000 square foot veranda with panoramic views of the sculpture gardens. The mansion displays an eclectic mix of antiques, keepsakes and cherished artwork. Also on the property is a 3-car garage above which sits an artist’s studio. The manicured property includes seven formal gardens, two swimming pools (indoor and outdoor) with pool cabana, a tennis court, a basketball court, three playgrounds and an English conservatory. This residence evokes a spirit of comfort and an entertaining ambience at every turn. 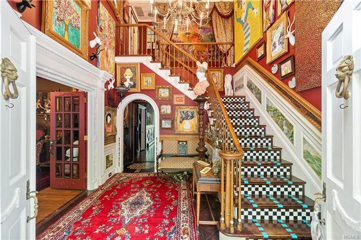 It’s a one-of-a-kind masterpiece awaiting that one client seeking grand and extraordinary. Douglas Elliman’s Anthony Debellis (914-618-1737) is marketing the property.